We are so blessed this day because we have three psalm settings to share for the Fifth Sunday of Lent. Our two compositions in English are by Tinnah M. dela Rosa and Jeffrey Ray 'Migs' C. Miguel, while the composition in Filipino is by Kent Lardizabal. Please click the pictures above or the highlighted link to download the high resolution PDF files of our composers. Click the highlighted link to view the readings in English for next Sunday (April 6, 2014) via the US Conference for Catholic Bishops website or the readings in Filipino via the Word and Life Publications. Are we all familiar with Psalm 23: The Lord is my Shepherd? When we encounter this Psalm of David, we immediately recall the Lord Jesus depicted as carrying a sheep over his shoulders, holding a staff, and flocked by sheep. While we remember this image, do we also realize how simple yet powerful the words of that passage speak to us? The Lord, our Shepherd, promised us to be there in every need, despite our weariness and our weakness. He provided for us in times of need. He gave us rest when we get tired of life. He refreshes us when our minds and souls turn gray cloudy. Yet, on top of all these, He picks us up and leads us to the right path, and He serves as our light in the dark. He even prepared a table for us in the midst of cruel beings! Only a Good Shepherd does that. With all our shortcomings, why does the Lord still do all of these good things for us? He simply wants us to do the same: to reciprocate all things with love. He loved us so much that He is able to shepherd even the wandering and the doubting. The whole psalm is an invitation for us to love as he had loved us. Take a moment to reflect and pray about the Lord's invitation for us to love just as he did. May you be comforted by this wonderful setting of Psalm 23 by John Rutter. May Jesus our Good Shepherd be our role model in living and loving. Many thanks to Joseph Pierce for putting together this video and Em Alcantara for this reflection! 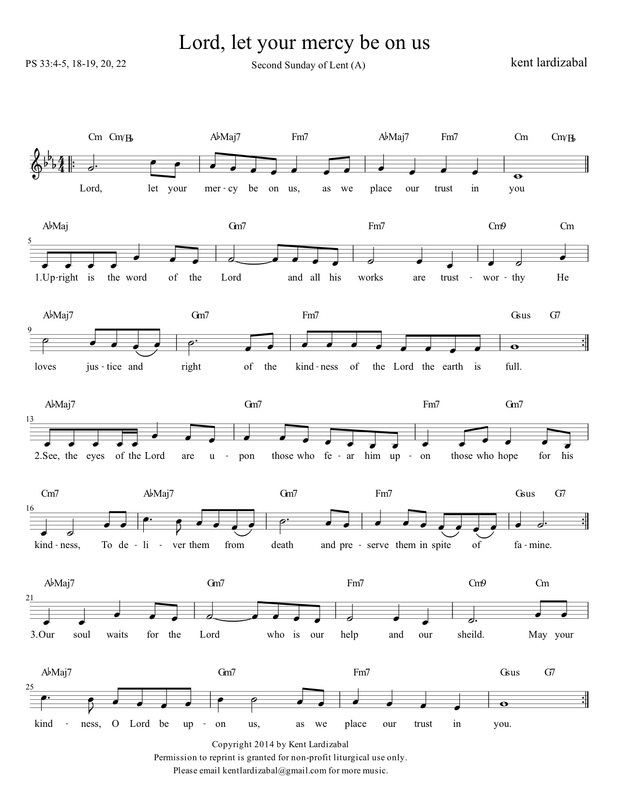 Today we are sharing compositions for Evening Mass of the Lord's Supper on Holy Thursday by our contributor Migs Miguel. He is sharing a 1-page a responsorial psalm "Our Blessing Cup is a Communion" and a 7-page choral piece, "Where Charity and Love are Found," for the Preparation of the Gifts. This is our last and final installment this year in preparation for Holy Thursday. 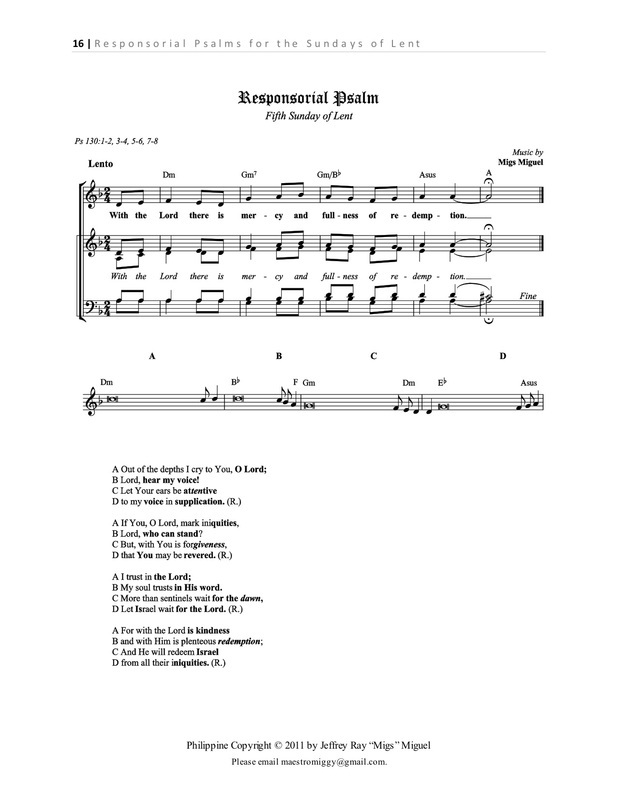 We also posted last March 11 the responsorial psalm for Holy Thursday by Tinnah dela Rosa. "It is the Lord’s example: he is the most important, and he washes feet, because with us what is highest must be at the service of others. This is a symbol, it is a sign, right? Washing feet means: “I am at your service”. And with us too, don’t we have to wash each other’s feet day after day? But what does this mean? That all of us must help one another. Sometimes I am angry with someone or other … but… let it go, let it go, and if he or she asks you a favour, do it. Now we will perform this ceremony of washing feet, and let us think, let each one of us think: “Am I really willing, willing to serve, to help others?”. Let us think about this, just this. And let us think that this sign is a caress of Jesus, which Jesus gives, because this is the real reason why Jesus came: to serve, to help us." 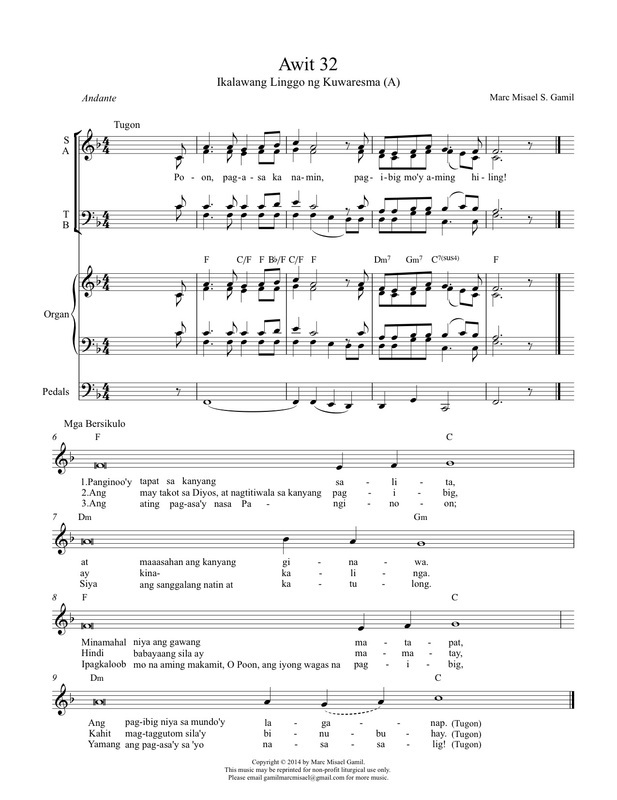 Click the highlighted links to download the pieces: "Where Charity and Love are Found" by Migs, the Responsorial Psalm by Migs, or the Responsorial Psalm by Tinnah. We are so blessed this day because we have four psalm settings to share for the Fourth Sunday of Lent. We have two compositions in English by Tinnah M. dela Rosa and Jeffrey Ray 'Migs' C. Miguel and two in Filipino from Jeffrey Ray 'Migs' C. Miguel, and Kent Lardizabal. Please click the pictures above or the highlighted link to download the high resolution PDF files of our composers. Click the highlighted link to view the readings in English for next Sunday (March 30, 2014) via the US Conference for Catholic Bishops website or the readings in Filipino via the Word and Life Publications. Do you find it easy to ask for forgiveness? When was your last confession? Lent is a wonderful season of prayer, sacrifice, generosity and mercy. Perhaps some of us are hesitant or anxious about receiving the Sacrament of Reconciliation, but it all begins with an acceptance of our human weaknesses and sinfulness and a great desire to change and be forgiven. Are we humble enough to acknowledge our mistakes? Are we truly sorry for our sins? Take this time of prayer not only to call to mind your sins but also to recognize that we have a merciful Father, always welcoming us back and running to meet us to shower us with His infinite love and mercy. 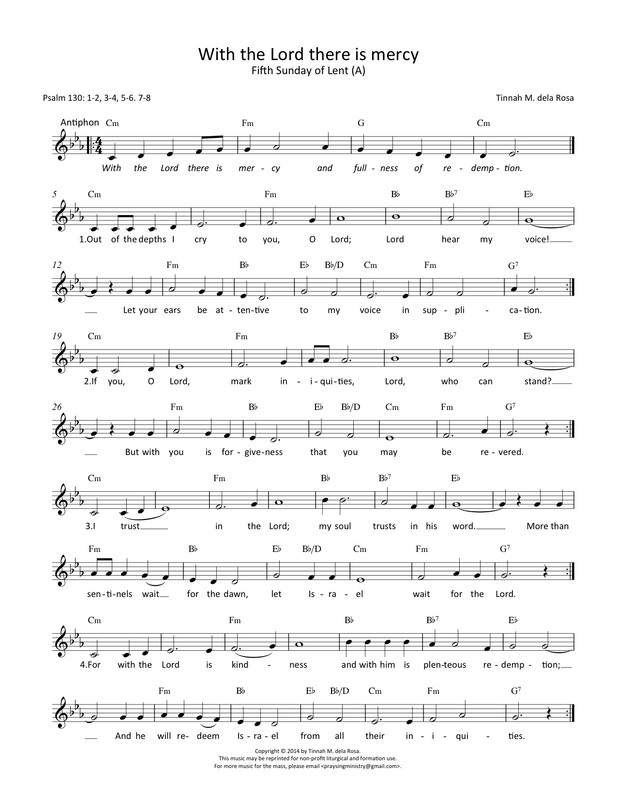 As you pray with the song, “When God Ran” by Philips, Craig & Dean, ask for the Lord’s forgiveness and remember that though we may be unworthy of His grace and mercy, He will never cease to love and to forgive us. With a contrite heart and strong faith, there is no sin that is greater nor beyond God’s forgiveness. May you be a source of mercy and love today and everyday! Have a lovely Thursday! Many thanks to phoeves for the video! Today we are sharing a sample recording of the piece Pitong Huling Wika ni Hesus (Seven Last Words) composed by Tinnah M. dela Rosa. Jesus uttered seven last words as he hung on the cross. These seven last words hold great meaning to those who wish to ponder his passion and death. 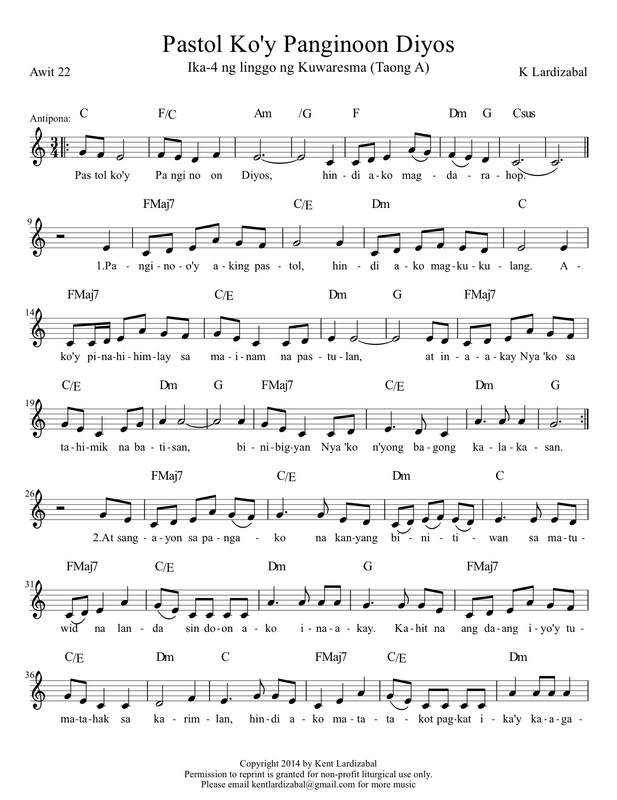 These short songs in Filipino are intended to be repeated again and again during the reflection time of each of the seven last words to give it a meditative character. It is our hope that as the words are sung many times over, that the meaning of the passion and death of Christ will penetrate the whole being of those who sing them. 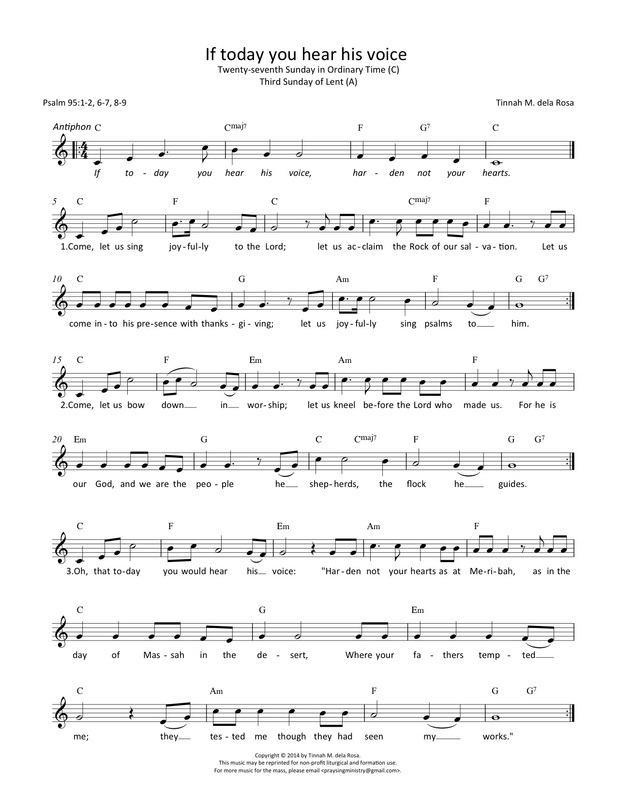 This meditative style of singing can help one grow in one's way of listening to God. Much like the short Taize prayers/songs, it allows everyone to take part in a time of prayer together and to remain together in attentive waiting for God, without having to fix the length of time too exactly. 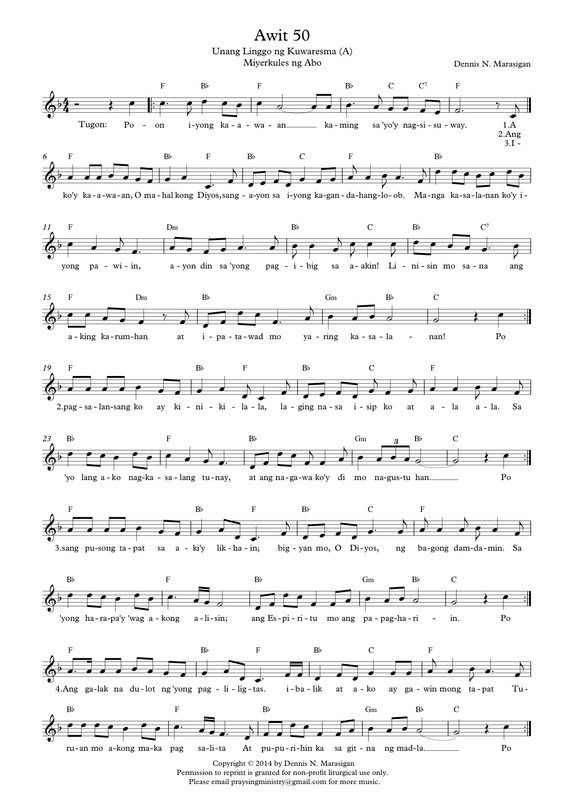 We thank our PraySing Ministry contributors Ms. Em Alcantara and Ms. Ledda Vinzons for offering their time and talent to prepare this music sample. We hope this video helps all of you prepare meaningfully for the Seven Last Words reflection. You may download the 2-page setting here. 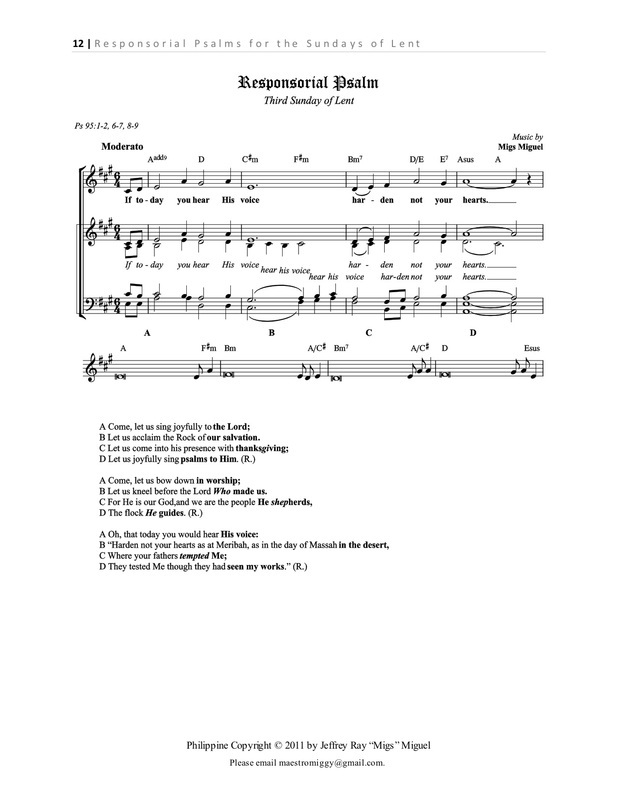 We are so blessed this day because we have three psalm settings to share for the Third Sunday of Lent. We have a composition in Filipino from Mark Anthony B. Laroya, and two in English by Tinnah M. dela Rosa and Jeffrey Ray 'Migs' C. Miguel. Please click the pictures above or the highlighted links to download the high resolution PDF of Tinnah, Migs, and Mark Anthony. Click the highlighted link to view the readings in English for next Sunday (March 23, 2014) via the US Conference for Catholic Bishops website or the readings in Filipino via the Word and Life Publications. Who are the people around you who are most in need of your help? What help can you offer them at this time? One of the best ways to imitate Christ as we journey through this Lenten Season is not only through praying and fasting, but also in giving. Giving can be in the form of alms and donations to your favorite charities, but it can also be an act of service, especially to those who are most vulnerable - those who are needy, poor, alone, lonely, mourning, or in pain. As you pray with "The Servant Song," composed by Richard Gillard and performed by Bukas Palad Ministry, we invite you to recall those people around you who are most in need of help that you can render. Ask the Lord to give you the compassion and courage to reach out to them and to serve them without counting the cost. Speak to the Lord about how you can imitate him better as you serve others. These days of Lent are an opportunity for us to encounter Christ anew as we extend our assistance to people around us. May you not be afraid to be a "servant" to another... to be another Christ to others. Thank you to meansusa for the video! 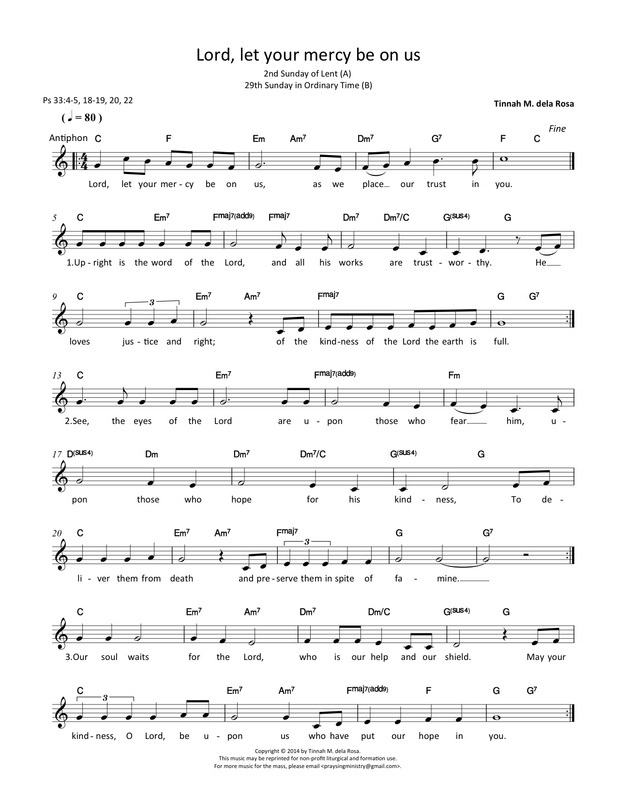 Our post today is a responsorial psalm composed by Tinnah dela Rosa for PraySing Ministry that you can use for the Evening Mass of the Lord's Supper on Holy Thursday. 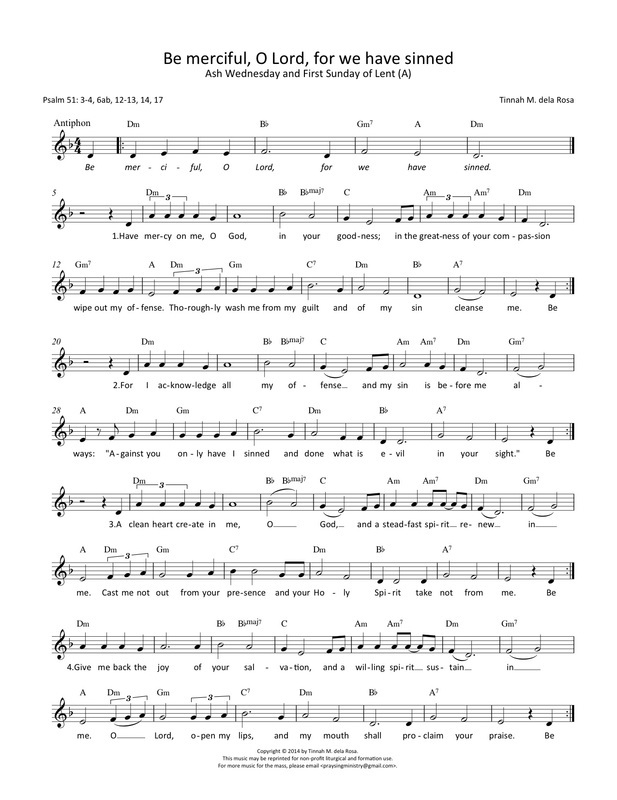 You may download a higher resolution PDF copy of this song here. 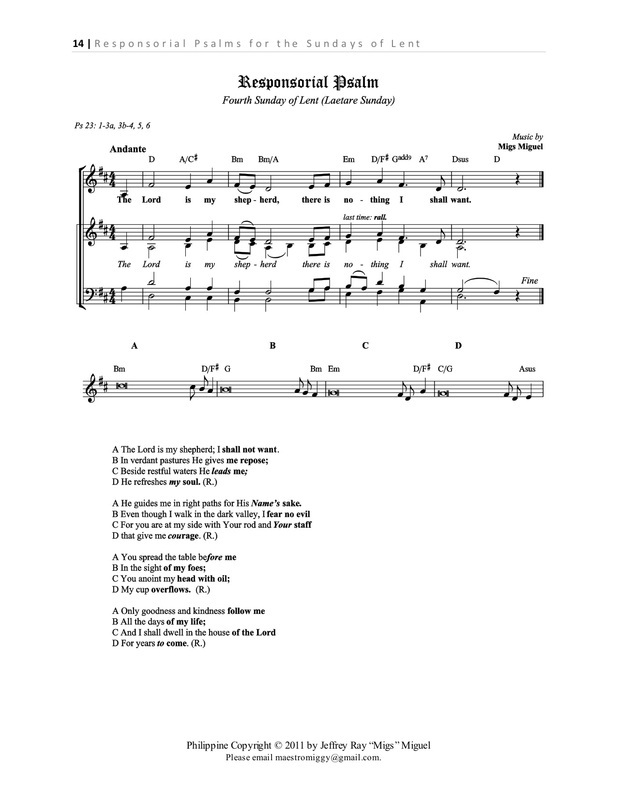 We are so blessed this day because we have four psalm settings to share for the Second Sunday of Lent. We have a composition in Filipino from Marc Misael S. Gamil, and three in English by our regular contributor, Tinnah M. dela Rosa, and our new contributors, Kent Lardizabal and Jeffrey Ray 'Migs' C. Miguel. Kent Lardizabal is a self-taught musician who is involved in Supply Chain/IT work. He is a full-time father and husband based in Mississauga, Ontario Canada. Migs Miguel is a young composer, church organist, singer, choir director and a music student at the University of Santo Tomas Conservatory of Music (Major in Composition, Minor in Piano). He regularly serves as church organist in the Shrine of the Five Wounds of Our Lord Jesus Christ in Las Pinas City. 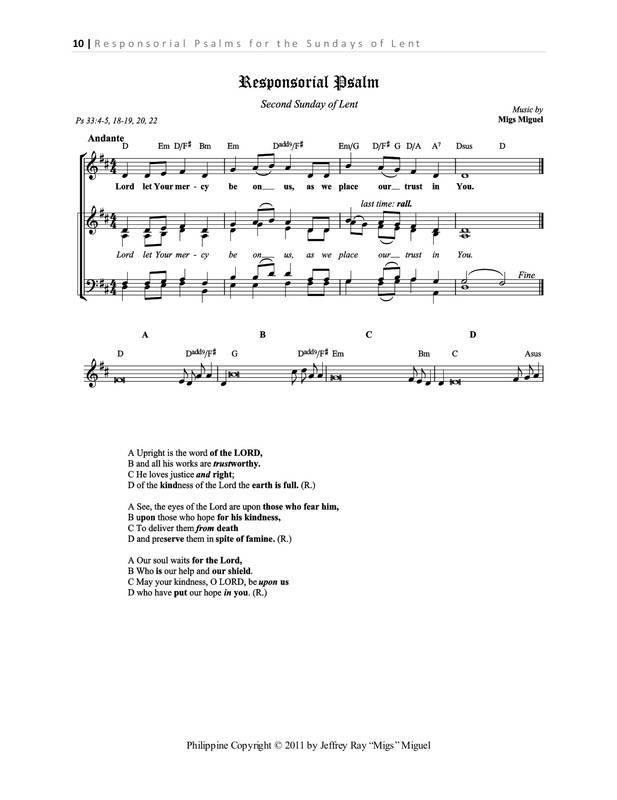 The psalms we will be posting here are part of a collection of he composed in 2011 which you may find in our Responsorial Psalm page. We are blessed to have them join our growing family of psalm composers at PraySing Ministry! Please click the highlighted links to download the higher resolution PDF of Marc, Tinnah, Migs, and Kent. Click the highlighted link to view the readings in English for next Sunday via the US Conference for Catholic Bishops website or the readings in Filipino via the Word and Life Publications. We can give up many things this Lent. But it is sometimes good to reflect on why we do so. Will fasting from certain things change us? Will they help us gaze more on the Lord and His compassion that transforms? Will they help us to understand the profound love that God has for us through his Son? Will they help us see his constant invitation for us to come back to Him? Or will our fasting simply make us rely on own efforts to become holy? Finally, will our focus on our own effort of fasting crowd out the space for God's transforming grace? This Lent we are reminded that we are here because of God's love, made manifest in His Son, Jesus Christ. It is a "love that never ceases to embrace a weary heart and give a brand new start" according to the song "Because of Your Love" performed by Nyoy Volante. Speak to the Lord about what it is you are giving up or fasting from this Lent. Invite the Lord to help you identify attitudes, attachments or sinful tendencies that you also need to give up. Ask Him to help you use your fasting and abstinence to come back to Him and to fix your gaze on Him. What we give up for Lent can change lives, especially our own. May the attitude, attachment or sinful tendency you choose to give up lead you to come closer to our God who is love. Many thanks to pixelcherry821 for the video! Jesus uttered seven last words as he hung on the cross. These seven last words hold great meaning to those who wish to ponder his passion and death. 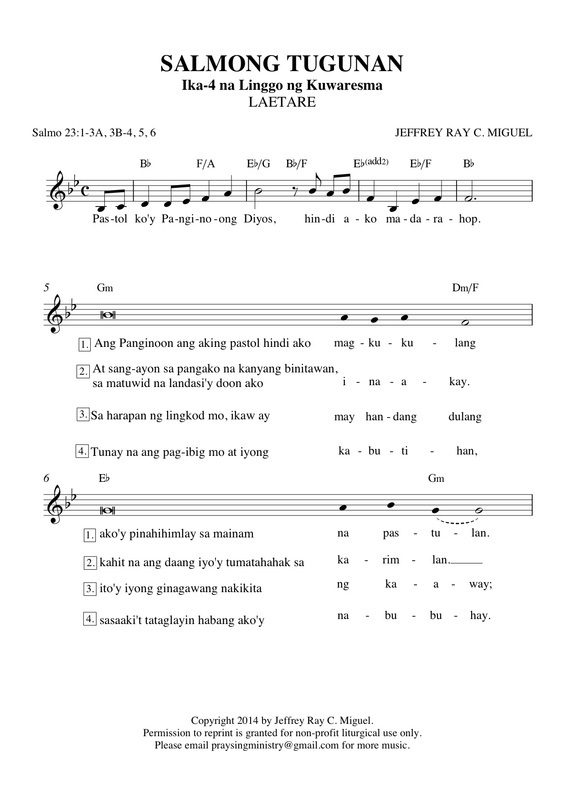 We now offer a setting of these short songs in Filipino, intended to be repeated again and again during the reflection time of each of the seven last words to give it a meditative character. It is our hope that as the words are sung many times over, that the meaning of the passion and death of Christ will penetrate the whole being of those who sing them. 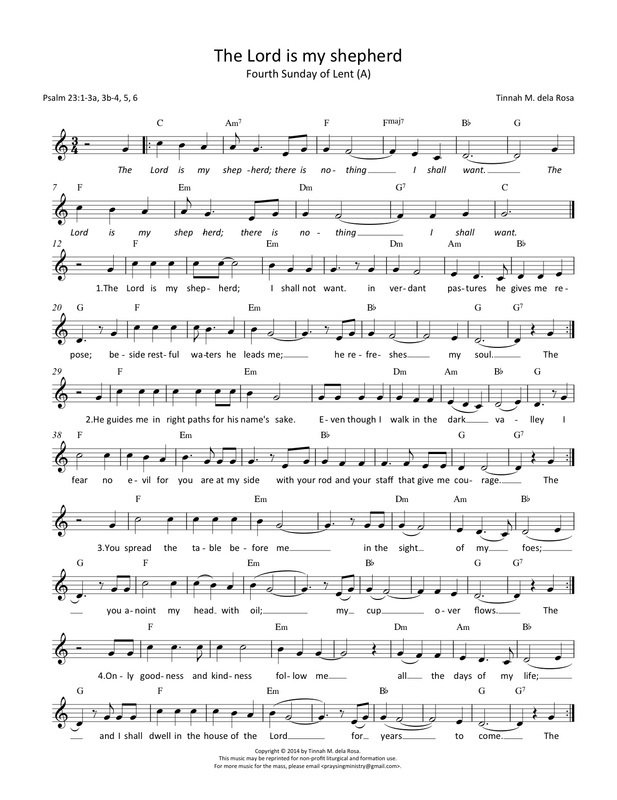 This meditative style of singing can help one grow in one's way of listening to God. Much like the short Taize prayers/songs, it allows everyone to take part in a time of prayer together and to remain together in attentive waiting for God, without having to fix the length of time too exactly. We thank our resident composer Tinnah M. dela Rosa for this setting which we hope will help all of you prepare meaningfully for the Seven Last Words reflection. You may download the 2-page setting here. We shall share a sample of these songs soon. If it helps you to pray, you may go to Loyola Press for an online prayer that commemorates each of the Seven Last Words in a separate Flash meditation. 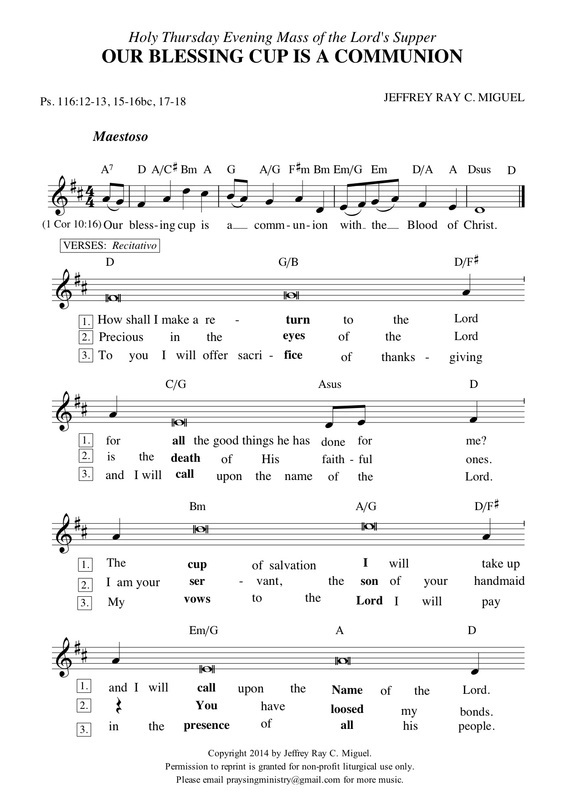 Our two psalm settings for the First Sunday of Lent are original compositions by Tinnah M. dela Rosa (in English) and Dennis N. Marasigan (in Filipino). It also happens to be the psalm for Ash Wednesday. Please click here to download the higher resolution PDF of Tinnah and Dennis. Click the highlighted links to view next Sunday's (March 9, 2014) readings in English via the US Conference for Catholic Bishops website or the readings in Filipino via the Word and Life Publications.